Perfectly Created Chaos! 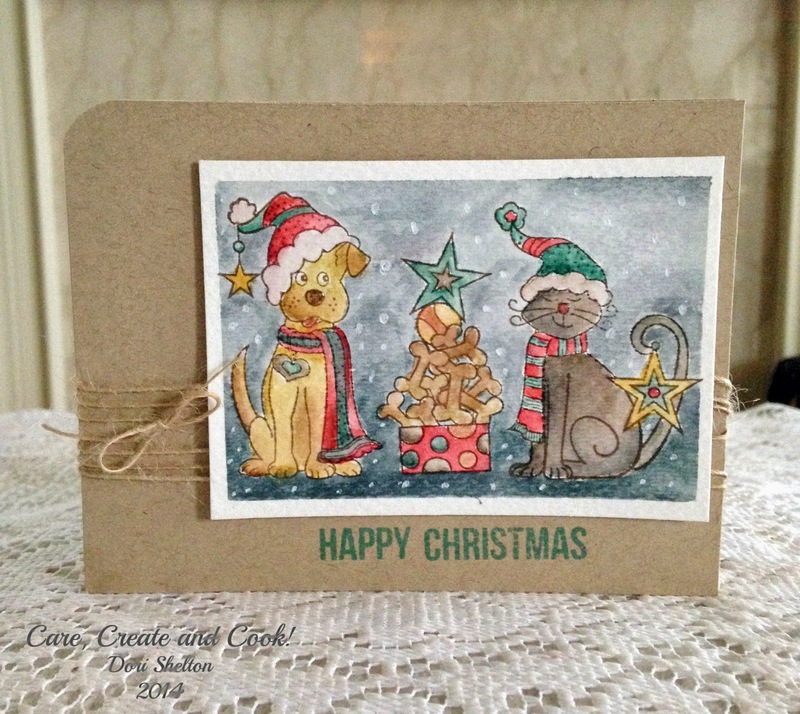 : 25 Days of Christmas: Day 17, "Furry Friends Happy Christmas"
25 Days of Christmas: Day 17, "Furry Friends Happy Christmas"
Today's card is for all you animal lovers out there. I found this adorable stamp set from Hampton Arts at Michael's and used them to create this cute little "gift giving" scene. I love the almost smug look on the kitty cat's face, like "See? I brought you something, aren't I the best cat you know?!" The dog is just happy to have all those bones to himself! I stamped the images on to Strathmore watercolor paper in Rich Cocoa Memento ink. I used some distress markers with a water color brush to color them in and then used Weathered Wood Distress ink to watercolor the background. I wrapped some May Arts Natural Twine around a side-folding Kraft card base and then stamped the sentiment at the bottom. I added the image panel with some foam dimensionals and then rounded the top corner with my We R Memory Keepers Corner Chomper to finish the card. Here are the two cards side by side for you to see. Not exactly the same; but I think my rendition captures the spirit of Kristina's pretty well! Once again, I thank you for visiting with me. Have a great day; and I'll see you tomorrow for Day 18!